This ink was a little bit of a surprise. 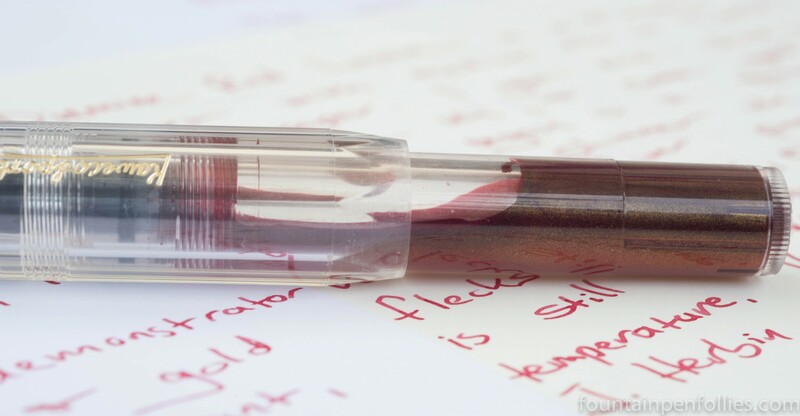 Diamine Red Lustre is a red ink, with gold particles, yet it somehow isn’t a dark, warm red color. Instead it feels elegant and cool. I love it when an ink confounds expectations and offers something interesting. Yes, I did, both Blue Lightning and Red Lustre. With Blue Lightning, the shimmer comes through nicely and it’s not particularly feathery. On poor paper, Red Lustre is susceptible to feathering but the ink color darkens and the shimmer is even more noticeable. With the feathering possibility, I would probably sample these first if you are going to have to use them on bad paper. I like understated, cool tones. Have you tried this one on ryn of the mill, everyday copy paper? Does any of the shimmer come through, or does it come out flat?